iPad and Android tablet mobile apps allow a sales team to graphically demonstrate varying component configurations prior to customer purchase. Electrical component manufacturers often offer numerous combinations of product configurations. As a simple example, consider an LED array having multiple "dash number" suffixes attached to a base part number. The base part number identifies the package style. The suffix number indicates the color of the LEDs assembled into the package. The configuration becomes more complex as more options and suffix numbers are offered. Some combinations of options may not be compatible - something that may be difficult to determine from a catalog page or static product image. Such was the case for a manufacturer of relay and switching components. Our client found that a majority of their sales calls were related to questions about product configurations and compatible accessories. A convoluted selection process made it difficult for sales personnel and end users to choose the correct components. Tecnova had already simplified the configuration process for web users using standard computer browsers. A portable mobile app was the logical next step. 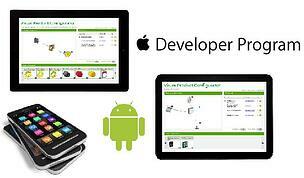 Tecnova was asked to create mobile apps running on the popular iPad iOS and Android operating systems. The apps are based on Adobe Flash Professional and developed for the specific capabilities of each target tablet OS, file structure, and touch-screen input. The apps walk the user through base part number selection and all compatible accessories until a valid configuration is created. The final list of components can be emailed to the end-user. The resultant mobile apps are distributed through standard cloud sources: the Android Market and Apple App Store. The apps have extended the reach of the product configurator to the mobile marketplace, significantly reducing customer confusion and the number of sales support calls due to improperly configured relays and switches.